Preheat oven to 375°. Combine all ingredients in medium size bowl. Mix thoroughly. Shape mini-loaves into small footballs. About the size of your palm. Place mini-loaves on a broiler pan (I suggest rubbing a little olive oil on it to prevent sticking), and place on middle rack of preheated oven. Cook about 20 minutes. An easy variation would be to toss in carrots, or red peppers. The small loaves make for a fast, delicious dinner, and also help with portion control. 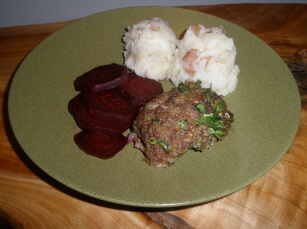 The loaves are shown served with beets, and red skin mashed potatoes.